Kantha embroidery has become one of the most popular forms of embroidery in the present time. This style hails from West Bengal, however, over the time it has spread itself across the country. Not only this, various forms of Kantha styling have made their debut on a global level too. As a result, Kantha is being sold like hotcakes by the Kantha wholesalers across the country and abroad. This form of embroidery is not just restricted to any particular form or pattern. Different forms of Kantha are used to create different varieties. Kantha has seven different types. Each of these types is specifically used in the designing and manufacture of different Kantha products. The craze of Kantha is not just restricted to a particular type, pattern, design or variety – Kantha is popularizing itself by its wonderful creations belonging to multiple varieties. Kantha wholesalers are extracting huge profits out of their business of selling Kantha in different forms and patterns. Kantha embroidery was traditionally dedicated towards creating dhotis, quilts and sarees. However, over the time, the culture and fashion of Kantha evolved itself to make its entry into the Indian fashion as well. The yarn is now taken from all the old and ragged sarees after which the design is traced. Finally it is covered with the running stitches and made into various apparels. The handloom industry, too, is making the most use of Kantha embroidery. The beautiful Kantha embroidery is seen and found on a number of pillow covers, shawls, dupattas as well as several home furnishings. According to famous Kantha wholesalers, day to day life is considered to be the biggest source of inspiration behind this craft. Kantha involves the designs of a number of motifs of different figures of birds, animals, folk scenes, fishes and various imagery depicting different views of livelihood of the people living in Bengal. Apart from this, reprocessing and recycling is considered to be yet another form of motivation of the Kantha embroidery. This is because initially the women would recycle their old clothes to turn and transform them into something more practical such as blankets, covers for furniture, etc. The work and creativity of Kantha has been prevailing around for ages and the same has become the hottest pick of a majority of designers. The interior decorators and artists, too, are showing a great interest in this form of embroidery. Many innovations of Kantha have been taking place lately and all these innovations are becoming popular among all the fashionistas. The demand for Kantha embroidery is not just restricted to India alone, but the same has received a global recognition. The designers in the UK and Japan are reaching out to local Kantha wholesalers to use this form of embroidery into their own designs. Kantha is being promoted globally in a number of forms. Kantha work has been in flourishing itself for centuries and it still makes the Indian fashion and handloom industry go around. Many developments are being made in its technique and different flavors of style are being adopted to popularize Kantha all the more. If you have been hearing a lot about Kantha in the fashion world lately, then you must know that Kantha has become the hottest trend in the fashion world today. Not only in terms of fashion, the popularity of Kantha is reaching almost everywhere and this form of embroidery is popularizing itself by each day. Indian Kantha quilts have taken the entire fashion and textile world by storm and the same have received a huge recognition at the global level as well. Kantha is a famous style of embroidery which hails from West Bengal, India. This embroidery is considered to be a significant symbol displaying the skill as well as the talent of the rural women of Bengal who are the faces behind such beautiful creation and art. Kantha embroidery or Kantha stitch is similar to running stitch which is very simple in terms of its nature. Traditionally, this kind of embroidery is being used for designing quilts, dhotis and sarees, however, today Kantha has evolved and made its debut in the fashion world as well, wherein it is admired and used by a majority of fashion designers. The yarn is collected from the old saree borders. After this the design is traced and eventually covered with running stitches. This kind of embroidery is being found on various dupattas, shawls, pillow covers as well as home furnishing. 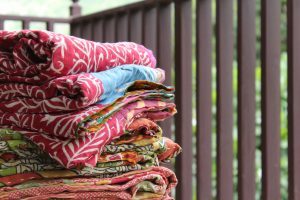 Likewise, Indian Kantha quilts have also popularized themselves with time and the same are being sold like hotcakes in the markets today. Kantha dates back 500 years old and there are several myths surrounding its inception and popularity. It is believed that Lord Buddha as well as his disciples made the use of old rags with various kinds of patch work in order to cover themselves during the nights. Thus, this gave the Kantha embroidery its origin. Today, Kantha embroidery is being used in a number of forms. Indian Kantha quilts are one such famous form of this embroidery. These quilts are colorful and fascinating in terms of appearance and this is the reason they are being sold by the Kantha wholesalers. Kantha embroidery is also becoming popular as it is seen in various household decorations. The Kantha curtains are colorfully displayed into the homes, thereby giving the rooms a Bohemian look. Kantha cushions, bed sheets, rugs, pillows, etc. are also making their place in the houses, thereby making a dull and boring room look more energetic and colorful. If the present day scenario is to be taken in consideration, Kantha embroidery has surely taken the entire fashion and interior decoration industry by storm. A number of artists and fashion designers are making more use of this kind of embroidery into their creations, thereby giving Kantha embroidery a new innovation and meaning. The handicraft industry, too, is making the most of this embroidery by transforming Kantha into beautiful Indian Kantha quilts, curtains, bed sheets and bed covers. Kantha is colorful and exquisite. Kantha is truly worth all the hype. The revival of Kantha in the modern industry is a good step. Kantha quilts have their origin from Southern Asia and these quilts have become one of the most trending home décor ideas of the recent times. A number of Kantha products are being sold like hotcakes and more number of people are buying these products to use them in one way or the other for the purpose of home decoration. 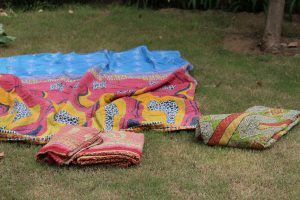 Kantha quilts were mainly designed for the purpose of warding off the winter cool that was experienced by the children in the rural areas of India. Thus, this is where the origin of Kantha blankets and Kantha baby quilts took place. Kantha is surely one comfortable fabric which keeps you warm and cozy throughout the cool winters. Moreover, the overall design of Kantha is just so beautiful and elegant. If you are a person who looks forward to buying bed-sheets which are good looking and elegant, Kantha bedsheets serve as the best choice for you. Let your mattresses embrace the beautiful, vibrant and colorful Kantha bed-sheets and take the entire decoration of your bed room to a next level. Kantha bed-sheets are beautifully designed for sure. The best thing about Kantha is that it could be taken into use in a number of ways. Thus, if you are an individual who loves to design your house with all the vibrant and colorful vibes, Kantha is the pick for you. The amazing Kantha table setting for your dining table is one excellent choice to decorate your dining table and to give it a unique and different look. Arrange your cutlery over the beautifully designed Kantha table setting and it would surely catch all the eyes. Kantha cushion covers are surely going to give a new touch to your old boring couch. The amazing patterns of Kantha can easily be woven on to the naked pillows in order to accentuate their beauty and make your décor classy and elegant. You can buy Kantha cushion covers in different designs and sizes from the market. At the same time, you can also take an old Kantha quilt into use to further turn it into amazing cushion covers. The colorful cushion covers of Kantha would surely add a beautiful theme to your house. The fashion of Kantha is increasing with each passing day and more number of people are buying to decorate their houses following different theme, ideas and concepts. Kantha is surely one of the most versatile fabric which could be used in a number of ways. The colorful appearance of Kantha makes it a great option to use it in a number of ways. Buy these amazing Kantha accessories and begin with the new project of decorating your house with the beautiful Kantha essentials. Organizing and decorating a house has never been an easy task. However, the process could become easy sometimes if you sample out the right things to be used for decoration. The house décor items such as blankets, quilts, bed covers, cushion covers, etc. play a very vital role in making any of your house space look rich, classy and sophisticated. Kantha products have become the flavor of season these days. From magazines to websites to experts – everything is touting Kantha to be the latest trend in house décor. You can therefore include everything Kantha into your house-decorating process to make it look all the more beautiful. Kantha cushion covers and Kantha quilts could be customized in a number of ways using which you can decorate your house like never before. Following are the 6 organizing hacks using Kantha cushion covers and quilts that are marked and suggested by the experts themselves. You can use your old Kantha quilts to give them a makeover into a bed-covers. Bed covers are very much in fashion these days and turning your Kantha quilt into a bed cover isn’t a bad idea at all. Use these bed covers in your bedrooms and living room and you are all set to create a new look. Kantha quilts can also be customized and used into Kantha curtains. For this particular purpose, you can also take an old Kantha saree into use. Decorate these Kantha curtains using various laces and frills. Kantha cushion covers have become the hottest Kantha trend. Ditch your old cushion covers and add a harmonious look into your drawing room by inculcating the beautiful Kantha cushion covers into the same. The beautiful prints of the Kantha cushion covers is surely going to add flavors into the boring sofa. Your old Kantha quilt or bed-sheet can also be recreated into a beautiful looking Kantha frame. You are merely required to pick your favorite Kantha print and further get it framed into a beautiful Kantha frame. Decorate it into your drawing room. Just like the bed covers, Kantha quilt could also be taken into use as a Kantha table cover. Table covers always add an extra flavor of beauty as to your boring table. Thus, what’s better than adding some beautiful and colorful prints of Kantha into the same? The results would be more than vibrant. You can also cut your Kantha quilt into small sized mats to further use it as to the decoration of your side tables or side stools. Thus, it is the time you forget your boring table mats and add a hint of Kantha into the same. These Kantha hacks are not so extravagant. You are merely required to take out your old Kantha quilt and give it a new touch to redecorate and renovate your house space into something extraordinarily beautiful.